I started the thread early because I found this screenshot floating around tumblr. Because I assume it was a part of today's episode, this was the only appropriate thread for it. She also seemed to accidentally the carpet. It's funny - Sapphire is definitely the dominant personality of Garnet but her appearance is strongly Ruby-based. Also we were all correct - Sapphire has one eye. Ahhh that whole EPISODE!!!!! RUBY!!! SAPPHIRE!!! SQUARE PIZZA!!!!!! AHHH!!!!! Oh lordy. This episode gave me so many feels, not just because of how strongly I can relate to Steven in this episode, but because Ruby and Sapphire's entire argument and conflict remind me of some incidents in another fandom on Tumblr that haven't been properly resolved, both on my end and another person's. I tried to be like Sapphire. I tried to be calm, rational, patient, and wanted to talk things out in said incident, though I admit I did lose my temper at points, but the other person acted just like Ruby: all she wanted was to be mad, make a huge song and dance out of everything, didn't want to come to a resolution or find a proper solution to said conflict, resorted to childish yelling and name calling (not that she'll admit it), thinks I have a victim complex, refuses to admit to her own errors, and acted as though I was nothing but a heartless demon child who deliberately hurt someone. Unfortunately, unlike Ruby and Sapphire, our conflict hasn't been resolved. It only got worse, it brought out the worst in us, and now we're nothing but mortal enemies. I didn't do myself any favors by letting it get the better of me to the point of starting a callout blog in an attempt to make them realize the truth, that they didn't handle the situation in a civilized manner or even talked to me about it. 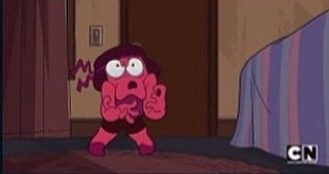 Really, Crewniverse?! Why are your episodes and conflicts so true to life?! Also...Sapphire has one eye?! She's a cyclops?! Laughy sapphie?! Oh deary dear! that's one of the best things about this show. even though it's a cartoon about space rocks (which for all intents and purposes should be entirely unrelatable), it manages to not only be something that a toooooon of people can relate to, but something people can learn from!! i have a feeling that what happened with ruby and sapphire (FANGIRLING BECAUSE RUBY AND SAPPHIRE), the conversation and the venting and the two sides of the issue becoming mixed up together and culminating in a huge thing is going to happen between pearl and garnet. maybe even all the gems! i super related to steven in this episode, as well as ruby and sapphire. i can't count how many times i've acted irrationally angry and upset over something small only to come to the conclusion that sapphire and steven did; it's their fault. they are to blame for things. i think its really really great that we get to see the show acknowledge different ways of dealing with anger (though you could say at one point, neither ruby nor sapphire were really dealing with it) and how both can be wrong, and both can be right. EXACTLY! I totally agree with you on the last line. Seriously, Ruby and Sapphire did what many people in the world, ESPECIALLY on Tumblr, really need to do: talk things out patiently and resolve things on both ends. Why can't people do that more often? It would make life a lot easier. right? unfortunately i think the show answers that as well, with that same point. people are going to act out their emotions differently and it won't always be in a way that's easily reachable or discussable. I love how they were practically making out on the spot and the only thing stopping them was steven was nearby. They probably did make out. We just didn't see it because censors are a thing. And because Steven didn't see it. We all know they made out. it was really lovely to see pearl and amethyst talking the way they were; heartfelt and feelsy, open and vulnerable. on the flip side, seeing garnet's reaction to pearl, even after ruby and sapphire had sifted through some of the feelings that were crushed and trampled by pearl's actions, she clearly hadn't resolved it. i think that goes to show just how deep pearl messed up, on an emotional level, for garnet. i mean, because garnet is the way she is, she obviously has a deeper understanding of fusion and its importance to her is on a completely different level than pearl and amethyst. but that doesn't mean that pearl is excused in her actions because she doesn't have the same understanding. taking advantage of someone is taking advantage of them, pure and simple. she had her choice, her motives, and she made it. "I'M AN ETERNAL FLAME, BABY!!!!!" This is my favourite episode, if only because I can see the sheer amount of fun the crew had while making it. I mean, Ruby's faces look really fun to draw and animate. I literally watched the episode over and over again because of the faces she made. I really like them. yepppp. she's so dynamic <3 my birthstone. i am pleased. Uhh...guys? I think Keystone Motel started a troubling trend in real life. I'm hearing stories about people leaving joke/false reviews on real places named Keystone Motel. This is bad. Yeah, I heard and saw. They're making false (both positive and negative) reviews about "a red child evaporated the pool" and "my room was cold what the hell this is summer." But really, this doesn't surprise me. Wiki vandalism on real gemstone pages happen all the time because some fans got bright ideas. This is different, as wiki vandalism has no harm as Wikipedia is not a reliable source because wiki vandalism was always a thing. Reviews, however, are supposed to be reliable. I don't think people want to stay at a motel with an evaporated pool because a red child paced around in it, even if it was a 5/5 rating. Me and my girlfriend had a huge fight here. AUgh I didn't really like much of the place and the carpets aren't heat resistant but they do have a pool. It was a good place for me to vent. And the room was a good place for my laughy sapphy to chill. Plus they have free ice. But my experience here wasn't that great. It was horrible. The room next to mine was freezing and it made my room super cold. I want down to the pool and there was a small girl with red skin pacing in the empty pool. I think there was a pedophilia incident because a van pulled up and I heard a child scream. These were from one in Pennsylvania, the state where the episode took place. However, most of the reviews were for one in Florida for whatever reason. I didn't mind the wiki vandalism, but the fact that this happened was not anywhere near surprising. If any of you here posted a fake review on any Keystone Motel, which I doubt, but in case, please remove it. You are negatively affecting a real business and any future customers, even if it was a 5/5 rating and an apology for what the idiots did. You are still negatively affecting real people. However, I really doubt that the show will get cancelled. I think that we may get an episode in season 3 that addresses why you shouldn't do this crap, but that's it.